For this 15oth PODCAzT I offer Pope Leo XIII’s 1888 Encyclical Exuente iam anno, On Right Christian Conduct. Despite the claims of many, the Church began neither with the Second Vatican Council nor the Pontificate of Francis. There are inestimable treasures available to us in the magisterial documents of Popes stretching back through the centuries. Today let us hear, in its entirety, this wonderful encyclical which could be addressed – and is – to us in this troubling age. 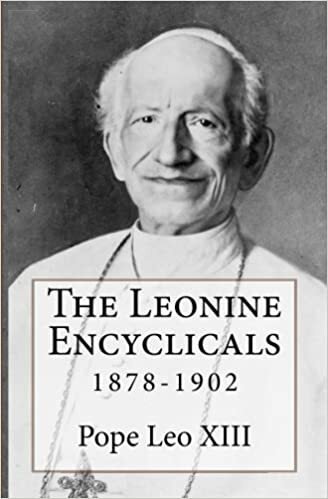 I’ll give you some pointers about Leo XIII, talk about the 1880’s and specifically 1888 and then give you the whole text. If you can imagine such a thing, encyclicals were used to be brief and clear. They didn’t make you scratch your head as you turned to the Roman Catechism or the documents of the Council of Trent to make sure that what you just read was really what you just read. But I digress. Leo paints a bleak picture, but he also offers consolations and counsel for how can can get out of this mess we are in with God’s help. He makes a powerful plea to clergy, to priests, for learning and for virtue and for detachment. Leo makes a strong case for the only thing that is going to help turn society around and avert the disaster that awaited every state and empire in history when it turned away from virtue. And Leo points to the fact that the pursuit of true virtues can only be rooted in faith in Christ. This entry was posted in Hard-Identity Catholicism, New Evangelization, PODCAzT, Priests and Priesthood and tagged Christian conduct, Exeunte iam anno, Leo XIII. Bookmark the permalink. Thank you very much, Father Z. Very hopeful, and I think you are correct about the knock-on effect that individual priests can have ( especially with, but sometimes in spite of, their bishops). Listening to the podcast now. Thank you for taking the time to make this. You set the background for the age in a very enriching way. Despite the claims of many, the Church began neither with the Second Vatican Council nor the Pontificate of Francis.!!!!!!!!!!!!!!!!!!! sad to say many Catholics believe that the church began withVII and Frances……..what a bunch of bologna!!!!! Liberals! Thank you for this Father. I listened to it on my way to and from work. It must have been quite a labour,hopefully of love. I particularly liked the way he describes having spent great efforts in support of truth and correcting error,what I believe Fr Hunwicke would call acting as a remora, before going on to speak now about living a holy life. I wondered,is the translation your own and do you have the Latin in front of you and as it were read that for us in English? Paraphrasing Leo XIII: “We acknowledge the power of God Who can draw great good from matters of the smallest moment.” Great line. Great podcast and sterling intro and closing.